Normally, I’m not into the traditional pineapple cake, so instead, I decided to turn a traditional dessert on it’s head and make something different and a little more fun, but using all of the same flavors. 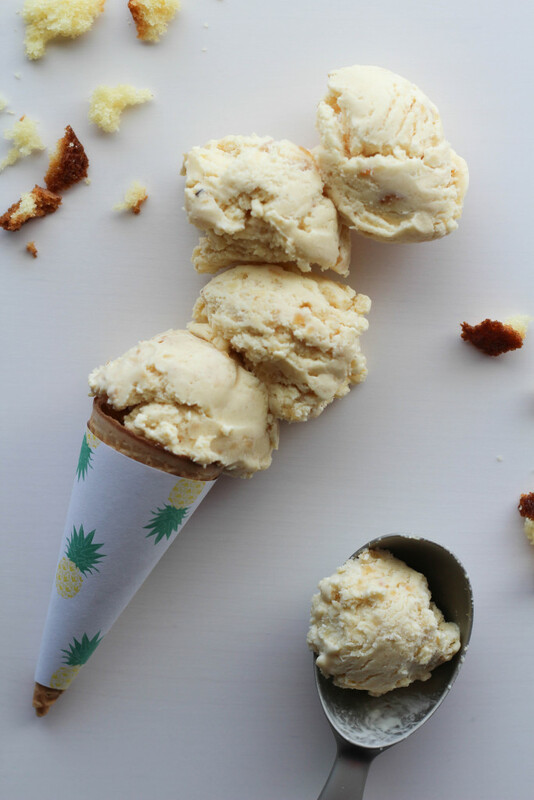 Pineapple Upside Down Cake Ice Cream, of course! I bought an ice cream maker a few weeks ago and had to try it out! (I bought this one) I was intimidated at first, but they are actually SUPER easy to use! I have so many other really fun ideas in the works to keep my ice cream maker busy, which I’ll be sharing on the blog soon enough! 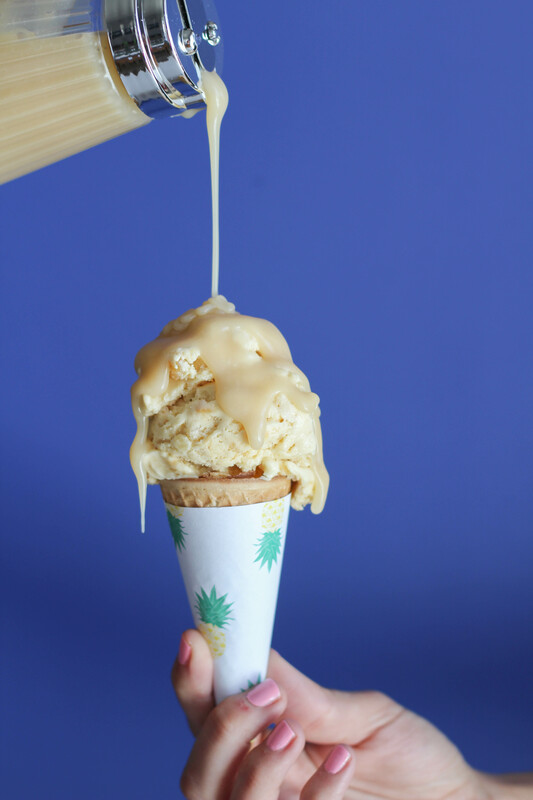 This pineapple ice cream includes caramelized pineapple bites, yellow cake chunks, and topped off with the most yummy caramel syrup! 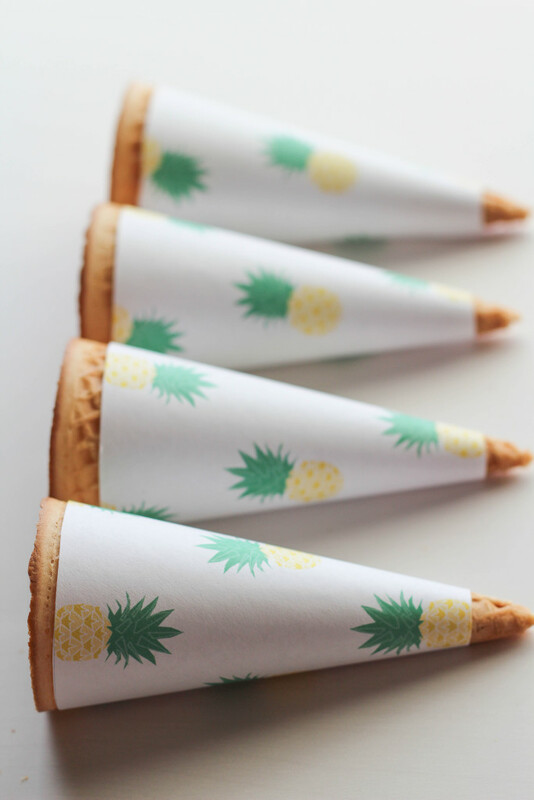 But it gets better….not only is the ice cream to die for, but I happen to have the CUTEST little pineapple cone wrapper downloads for you to print out and upgrade the cuteness factor on those waffle cones of yours! You can download yours here! 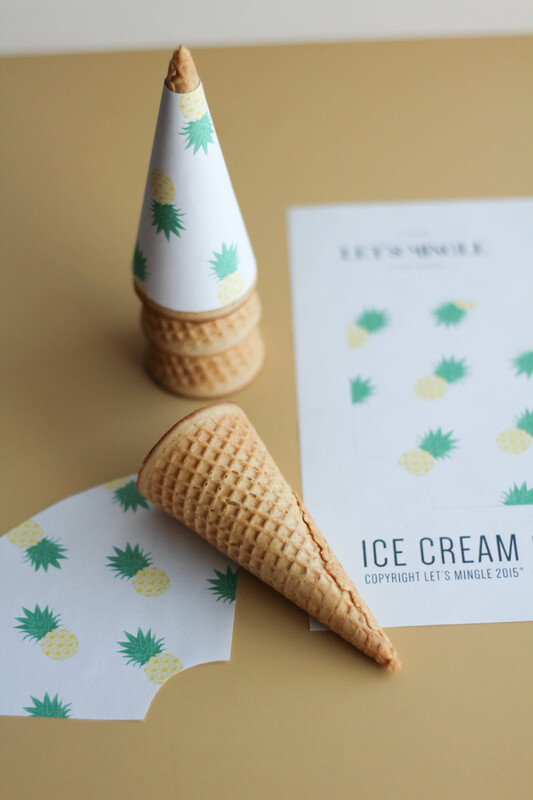 Does it get any better than pineapple upside down cake ice cream WITH free printable pineapple cone wrappers? I don’t think so. There are a few different steps involved to bring this whole mountain of goodness together, but it’s easy to do and the payoff in the end is AMAZING. 1). First up, make your ice cream. It will take the longest amount of time to do, so you’ll be able to prep all of the other steps while it’s chilling. Combine your milk and cream in a medium saucepan. Bring the liquid to a simmer over medium-high heat, stirring occasionally. Remove from heat. Whisk together egg yolks, sugar, and salt in a separate large bowl. Gradually add in and whisk half of the milk mixture, leaving the other half remaining in the saucepan. Pour the egg mixture back into the saucepan and cook over medium heat. Stir it constantly until it’s thick enough to cover the back of a wooden spoon. It takes about 6-8 minutes. Pour the finished custard through a fine sieve, into a bowl, that is set into a larger bowl of ice water. (Bowel of ice water on the bottom, smaller empty bowl on top. Make sure once the liquid is placed into the smaller top bowl, the weight won’t overflow the ice water in your bottom bowl!) Let the mixture cool, stirring it occasionally. Cover and refrigerate until cold. Keep it in there for at least one hour. I kept mine in the fridge for 3. If you want to prep this portion of the ice cream in advance, you can safely store the custard in the fridge for up to 2 days. 2). While your ice cream base is chilling, make your pineapple upside down cake mix, according to the direction on the back of the box. Once baked, let it cool completely. 3). Time to caramelize those pineapple tidbits! Melt the butter in a saucepan over medium heat. Add the brown sugar and cook for about one minute, while stirring the mixture. Add the pineapple and cook under the pineapple is soft and the mixture is smooth. It will get a slightly brownish-burnt look to the outside of the pineapple. 4). Take half of your finished pineapple tidbits and blend in a food processor with a smidge of heavy cream and 1/8th of a teaspoon of vanilla. 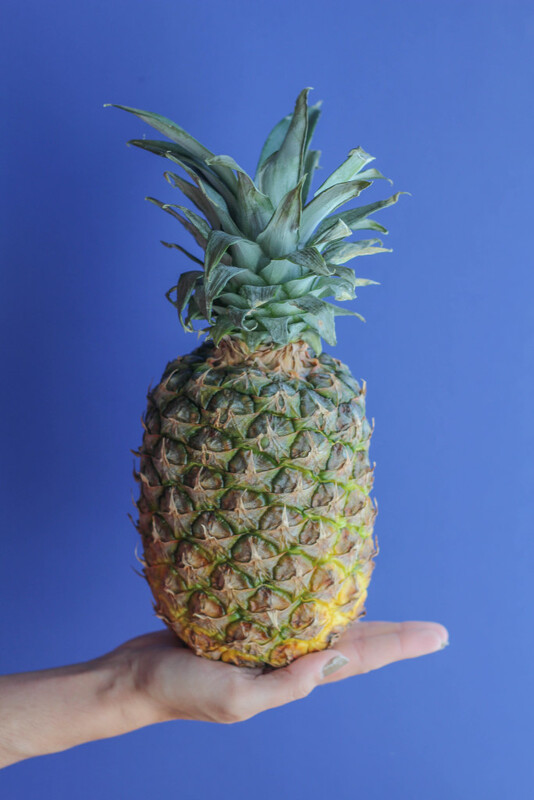 The liquid will help to blend the pineapple until smooth and prevent it from sticking together in a big chunk. 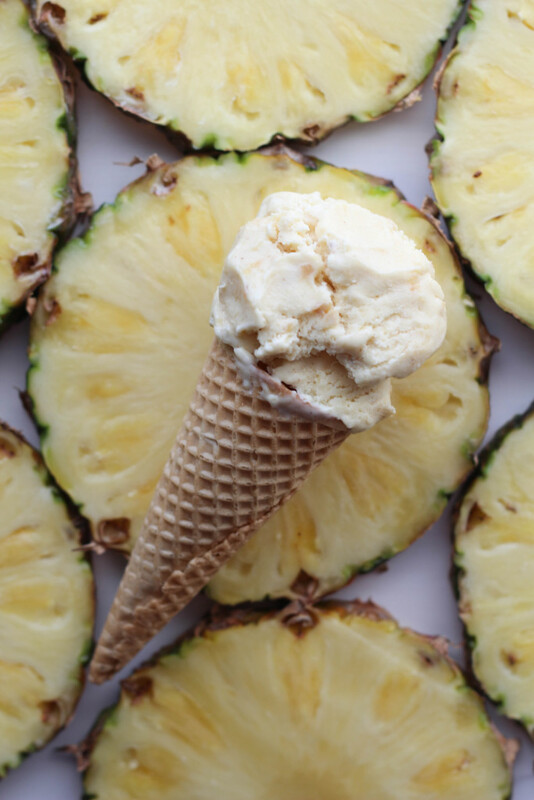 Once smooth, add the blended pineapples into the chilled ice cream base mixture and stir. Break up your cooled cake into chunks. (You can add as much or as little as your want). Once your ice cream churning cycle has finished, churn your ice cream for an additional 5 minutes while slowly adding the remaining pineapple chunks and your cake pieces. Transfer to a loaf pan, or an ice cream container of your choosing. Cover and store in the freezer until ready to eat! Most ice creams will last for a few weeks! 6). When you are ready to enjoy all of your hard work, it’s time to make that yummy caramel syrup! Melt the butter in a saucepan over medium heat. Add the sugar, lemon juice, and cook stirring constantly for 5-6 minutes. It will slowly turn a very light caramel color. Gradually add in the whipping cream and the vanilla and cook, stirring constantly for another 1-2 minutes, until smooth. It’s ready to be used immediately or you can store it in the fridge for up to 1 week. Just pop it in the microwave to re-heat! This stuff is so good guys! Like, GOOOOOD. I’m not really a huge fruity ice cream kinda gal, but I think all of the super healthy sugar in there 😉 really changed my mind. 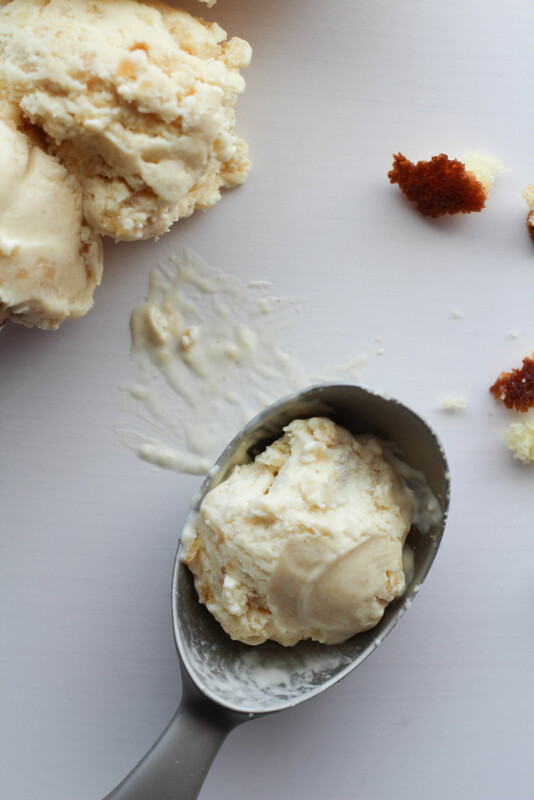 Whip up a batch of this for your family and friends and get ready for the ice cream flavor requests to come rolling in. No really…my dad has already make some of his own suggestions for future flavors. This looks amazing! I want to make it for my girlfriend’s birthday. Thanks for all the inspiring recipes! Okay, I’m a couple years late on this but I was curious how much ice cream this recipe would make. Let me know if you’re still checking. Looks like it’s worth the extra steps! It will make one batch of ice cream in an ice cream machine. Hard to say an exact amount, but it makes a similar amount to one ice cream carton.